If you’ve ever wondered if you’ve made an electric mistake, look no further! We’ve got the 7 most common mistakes. Don’t miss this week’s Your Dream Bath! Your cup will positively spill over with the knowledge you gain! Where does toxic mold grow? It can grow in your house! Find out some signs it might already be there by reading below! Ever thought about having your own grow station? We’ve sprinkled in some information on that too! If you’re going to handle any electrical projects yourself, you need to keep these in mind. Knowing the difference is huge when understanding electrical panels. Safety switches are to help prevent any electrical issues that can happen to you personally. It can detect electrical shocks before anything were to occur and will switch off the electricity before something happens. This can happen if a faulty electrical appliance is being used, as well as issues with the electrical wiring. Circuit breakers simply turn off the power when there’s too much electrical current being used. Having too much current can overheat an electrical appliance or wiring, which of course can lead to electrical fires or other damages. GFCI stands for Ground Fault Circuit Interrupter and it helps to monitor the amount of power being used in one outlet. For example, if you’re using one outlet for a powerful appliance or device, this will help to prevent electrocution— especially for those that are near water sources. GFCI will cut the power any time a slight variation is detected. It may seem like a pointless expense at first, but at the end of the day, it could save you a lot in damage. Junction boxes hold together the connected wires to avoid accidental damage, sparks and heat that can occur from a loose connection or short circuit. This will save you the hassle of dismantling and fixing wires. If your wires are cut too short, you’ll experience poor connection from the electrical circuit. Having a little slack in the electrical box is good, but not too much. You want to make sure wire connections are tight, while also giving the wire some breathing room. Using the same wire gauge will help to prevent overloading. You can do this by evaluating the size of your wiring, and applying the right type of gauge to your breaker. Connecting the black hot wire to the neutral terminal of an outlet creates the potential for a lethal shock. Always connect the white wire to the neutral terminal of outlets and light fixtures. The neutral terminal is always marked. It’s usually identified by a silver or light-colored screw. Connect the hot wire to the other terminal. If there’s a green or bare copper wire, that’s the ground. Connect the ground to the green grounding screw or to a ground wire or grounded box. Paul’s wife loves the look of a wall mount bath sink faucet, but wait! Paul prefers the faucet that sits on the bath sink. What are they to do? The Carey Brothers discuss the pros and cons of a wall mount vs deck mount bath faucet and shower Paul with knowledge. Before we get into the nitty gritty details, let’s cover the basic differences between the two faucet types. A deck mount faucet sits flush on top of a counter, table, or sink where it’s threaded through pre-drilled holes. A wall mount faucet, on the other hand, is installed directly into the wall, appearing as if it’s almost floating above a basin or tub. Wall mount faucet installation will require you to do some renovations to get the plumbing aligned with the exact location of the mounted faucet. This typically requires opening up the wall, moving/replacing the plumbing, then repairing the drywall and painting or tiling the wall to create the final, finished look. Oftentimes this is the biggest drawback for those considering wall mounts. The required updates can be relatively labor intensive, and they call for a professional plumber who knows his trade well – which may hike up the price. In contrast, deck mount faucets are much easier to install because most vanities and/or pedestal sinks come ready to “plug-and-play” with pre-drilled holes and plumbing, making this mounting option a much more budget-friendly option. When you install a wall mount faucet, you’ll have to pay careful attention to the height and length of the faucet in correlation to the sink. If you get the dimensions wrong, you could run into splashing or spillage issues. As with many home improvement projects, you need to think ahead to the future about repairs and replacements. This is especially true for wall mount faucets. While replacing a traditional deck mount faucet is a relatively easy do-it-yourself project, wall mounted fixtures may be more difficult to swap out. Because the plumbing of the wall mounted faucet is built directly into the wall, replacement may require removal of the wall where it has been mounted. That’s a big job and an even bigger headache if anything goes wrong. Before you go all in on a wall mount faucet, be sure to do your research and invest in a product from a highly respected manufacturer. This will give you reassurance that your faucet will last for many years to come, and, if needed, you can easily get replacement parts. While wall mount faucets require a little more time and energy to get just right, the final result is a visually stunning and a unique bathroom feature. When the project is all said and done, the wall mounted fixture will give your bathroom a beautiful finishing touch you’re sure to love for years to come. The most common type of financial help from the government for home repairs or modifications is through home improvement loans programs backed by the government. Some programs are available nationwide, while others are only available at the state or county level. Learn about the HUD Title 1 Property Improvement Loan program. Loan amount and repayment terms are limited based on the type of property. Find out about the 203(k) Rehabilitation Mortgage Insurance Program. This type of mortgage covers the cost of purchasing or refinancing and rehabilitating a home that is at least a year old. Contact your state Department of Housing and Urban Development (HUD) office or your local or county government housing department for programs in your community. Find information about energy efficient modification loans or incentives in your state. Review a list of FAQs about tax credits and rebates for Energy Star products and energy efficiency home improvements. Veterans can contact the Department of Veterans Affairs Home Loans Service about a loan or about specially adapted housing grants. Seniors can find tips on home safety and search for local programs in the Home Repair and Modification section of the Eldercare Locator website. Native Americans can learn more about the housing improvement grant program and call the Public and Indian Housing (PIH) Customer Service Center. Rural residents can contact a local Rural Development office for information about repair grants and loans. Eligibility requirements vary from program to program. In general, it depends on income level, age of the homeowner, type of property, or where the property is located. The average American’s get-clean routine requires about 8.2 minutes of shower time. Do the math, and that means United States dwellers spend close to an hour in the shower and use more than 120 gallons of water in just a week. Showerhead On The Loose? Try This! Fix a wobbly showerhead, or any wobbly pipe, with a few squirts of expanding foam. The foam encases the pipe in the wall and locks it into place, eliminating the wobble, so your showerhead will work like new. Chimney sweeps don’t only remove dangerous creosote buildup; they can clean out toxic mold too. Moisture can accumulate in the porous bricks and mortar of a chimney. Rusty chimney caps or flashing that needs repair allow rain and snow to seep in, creating an environment for mold to thrive. That may be the reason you smell something funky on days when the wind is blowing in a certain direction. Fix the cap and flashing and call the chimney sweep to extinguish the mold issues. Watch out for these other scary ways your fireplace could be toxic, too! People can have allergic reactions to mold, explains Purvi Parikh, MD, an allergist/immunologist with Allergy & Asthma Network. The symptoms can include itchy and watery eyes, coughing, and nasal congestion. If you suspect mold is triggering these symptoms, the American College of Allergy, Asthma & Immunology suggests you track your reactions for two weeks to see if they kick in when you’re in certain rooms or spaces within your house. You can also visit an allergist for a blood or skin test to confirm the allergy. If you’re allergic to mycotoxins, you’ll experience tingling, itching, or burning sensations when you come into contact with the mold. Your body is reacting by releasing histamines, and the result can be dry, itchy, and scaly skin; you could get hives. If the condition persists, see an allergist and look into ways to locate and eradicate the growth. Mold spores can find their way into the lungs and trigger asthma symptoms. One study found that dampness or mold in houses could account for one in five cases of asthma in the United States. If your asthma seems to be getting worse, you may have undetected mold in your house, according to the Allergy and Asthma Foundation of America. The group warns that mold can also cause a rare but more serious condition called allergic bronchopulmonary aspergillosis: This is a dramatic allergic and inflammatory reaction that leads to severe sneezing, coughing, and shortness of breath. Have you noticed that the paint is bubbling on the walls of your bathroom or near a window? One of the most common reasons paint begins to bubble is moisture. And where there’s moisture, there’s probably mold. You won’t be able to cover up the problem with a fresh coat of paint; you have to find the source of the moisture. It could be a leaky windowsill, too much humidity, or leaky plumbing. Once you fix the moisture issue, then you can repaint. Just make sure to scrape, patch, clean, and thoroughly dry the walls before rolling on the first coat. Watch out for these sneaky everyday objects you touch every day that can be toxic. The mycotoxin spores can find their way into your lungs and lead to a chronic, lingering cough. Your next step should be a call to an allergist. “Testing by a board-certified allergist is most helpful,” advises Dr. Parikh. “There is a lot of mold testing out there that is not evidence-based.” If you get a positive test for mold, the next step is to hire a mold eradication expert and address the problem. “Mold is a particularly common problem in bathrooms with inadequate ventilation,” says Yoel Piotraut, a managing partner at MyHome Design + Remodeling. A bathroom exhaust fan is an essential tool to keep toxic mold at bay—but it won’t work if it’s clogged or not running well. In fact, if it’s still steamy five to ten minutes after you get out of the shower, your fan isn’t circulating enough air. It may need to be cleaned or replaced with a unit that meets the square footage of your bathroom. Piotraut also suggests cleaning the walls regularly with a bleach solution or other mold-killing product. These are the household items you use that could be poisoning your air. According to a study published in Annals of Allergy, Asthma & Immunology, infants exposed to mold in their homes were three times more likely to develop asthma by age seven. Symptoms to watch for include coughing, especially at night; difficulty breathing; fast breathing; frequent chest colds; and wheezing or whistling sounds when exhaling. Here’s how to remove mold from your baby’s toys. We’re not knocking your cleaning skills, but mold that grows undetected can pose a real health risk. This is especially true for the elderly, warns Dr. Parikh. “Their symptoms are generally similar, but all chronic conditions are worse in the elderly as their bodies are not as resilient as [those of] younger patients and usually have other medical problems which may interfere with or complicate the treatment,” says Dr. Parikh. Here are 9 ways to get rid of mildew. “Exterior landscaping that is close to the home, as well as planters placed against exterior walls, can also lead to mold issues, especially for stucco homes,” says Gregg Cantor, President and CEO of Murray Lampert Design, Build, Remodel. Moisture finds its way inside the walls and can cause mold growth in the drywall and insulation. “This type of mold growth can be particularly dangerous because it’s rarely caught until the mold shows up on the interior of the wall, at which point the growth can be extensive and a danger to your health,” says Cantor. Watch out for these other sneaky backyard dangers you need to be aware of. Wave off the spider webs and take a closer look at the insulation in your attic. “Attic insulation that is very lumpy and uneven-looking may mean a bigger problem,” says John Bodrozic, Co-Founder of HomeZada. “The insulation could be in bad shape due to unforeseen roof leaks, which could also mean potential mold issues.” If your attic has poor circulation or improper ventilation, it could create ideal conditions for mold growth. Don’t let mold build up—in very rare cases, mycotoxins have been linked to heart problems and memory issues. Even if your health isn’t at risk, your walls, flooring, and appliances could be damaged. For those that do suffer from exposure to mold, it will need to be removed, says Dr. Parikh. “You will continue to react to it if you are allergic. It is especially troublesome for those who develop breathing problems from the mold, such as asthma.” Next, check out the 13 silent signs that your house is an unhealthy place to live. Ductless mini-split HVAC systems are the most commonplace choice for buildings around the world. According to the DOE, ductless systems accounted for $48.5 billion in global annual sales in 2012, compared with $6.7 billion for residential room and ducted air conditioners. There’s good reason for this global popularity: They’re generally easier to install than ducted air systems, use less energy to operate, and allow users to set individual temperature “zones” within one system. In recent years, American homeowners have become more aware of their benefits. In a ductless mini-split system, each room has its own individual air handler connected to a separate outdoor system, which may either be a heat pump or a dedicated air conditioner. 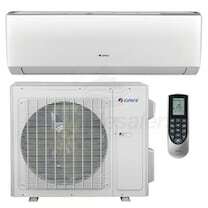 These outdoor units are generally smaller and contain smaller blowers than ducted central heat pumps, as they are designed to serve single spaces. Both single and multi-zone outdoor units are available, and up to eight indoor units generally connect to one outdoor multi-zone unit. The conduit between the indoor and outdoor unit contains the power cable, refrigerant tubing, and suction tubing, along with a condensate drain. This allows ductless systems to avoid the energy losses associated with forcing air through ducts, which can account for more than 30% of the energy used to operate a ducted air system, according to the DOE. Many of these losses occur when ducts leak or pass through unheated spaces, such as attics or crawlspaces. While conventional central air systems typically serve all the rooms in a home, even if not all of those rooms are occupied, a ductless system’s air handlers can be individually controlled or turned off altogether if no one is in the room. This helps save energy and increase comfort and control, as homeowners can set different temperature zones within their homes. Whether or not you favor cannabis legalization, medicinal and recreational marijuana for the masses is gaining momentum. Cannabis researchers report North American legal pot sales jumped 34 percent in 2016 to $6.9 billion, and spending on legal cannabis worldwide is expected to hit $57 billion by 2027. Several companies are racing to serve the cannabis markets, and a new category of home appliances is cropping up to position itself for new revenue growth. A new appliance called GYO was co-developed between Danby and BloomBoss, a leading manufacturer of high-efficiency, high-performance LED grow lights. It is a grow box designed specifically for home cannabis cultivation. GYO (pronounced “jee-yo” and stands for “grow your own”) contains a turnkey system to grow plants hydroponically – all the consumer needs to do is plug it into a standard 120-volt outlet, fill the reservoir, plant their seeds or cuttings and grow. The appliance is a self-contained environment that masquerades as a sleek mini-refrigerator and includes systems to regulate temperature and humidity. Powering the grow is an energy-efficient BloomBoss TrueSun LED, which keeps monthly operating costs low and increases the potency, flavor and aroma of the cannabis grown in it. San Francisco-based Cloudponics is first company to offer a completely automated system for growing marijuana (or any other plants) in your home. The GroBox controls air temperature, nutrients, humidity, water flow, airflow, light schedule and pH balance to sustain consistent, repeatable and predictable yields all with a mobile app. According to Cloudponics, the Grobox can produce about eight ounces of dried, cured cannabis every four months. In case your client lives in an apartment building or has kids, the box locks and can only be accessed by those who have the app on their phone, A refill service delivers filters, sensors and nutrients tailor made for 60 different strains every six months for $200.